"On high shelves, store boxes on their sides so their labels can be more easily read through the shelf mesh from below." "Install a blackboard on the inside of your pantry door to jot down the things you need. Before you leave for the market, snap a photo with your cell phone. Instant, super easy, grocery list." Amy, Christy and Terry at Eleven Magnolia Lane. What is a Butler's Pantry? Since 1900 the meaning of the word "pantry" has changed. Today it means a place where food is stored, and usually refers to one or more cabinets or a closet adjacent to the kitchen. In the late Victorian age the room where food was stored was the "larder". The pantry was a serving area located between the kitchen and dining room. Often it was not much more than a wide hallway equipped with ample countertop space and, commonly, a sink. Typically the butler would fetch the cooked food from the kitchen, divide it into serving portions, arrange it on dishware, then serve it. The pantry usually had swinging doors at both ends which helped keep kitchen noise, heat and odors away from the diners. With the simplification of house design that occurred during the Arts & Crafts period of the early 20th century, the butler's pantry was largely eliminated and replaced with built-in cabinetry inside the dining room for storing dinnerware, linens, glassware and silverware — all the things formerly stored in the pantry. Improvements in cooking technology, such as the natural gas or electric cookstove made isolation of the kitchen from the dining area much less important to dining comfort. Still, heat from the kitchen remained a potential problem, so a single swinging door was usually retained to keep the noise and heat at bay. Today the tendency is to call any walk-through or walk-in pantry a "butler's" pantry, but this term is not strictly correct unless it includes a counter-height set-up and serving area, and possibly a small sink. In a modern household, the serving area makes a convenient landing zone for loading groceries into the pantries — at least until you finally get around to hiring a butler. Buttery: Has nothing whatsoever to do with butter. It is an old English term for a room (or more likely a shed) where food was stored in large barrels called "butts", hence "buttery". Dish Pantry: Typically a cabinet or closet just off the kitchen or in the dining room where dishes and serving ware are stored. Larder: A small, room or tall cabinet for storing food. Used primarily in Britain to mean pantry. Archaic: a well-ventilated room for storing perishable items. The more modern term is "cold pantry". Read more about cold pantries below. Every kitchen needs a pantry — a notion that has not always been thought to be true. During the post-war building boom, pantries fell out of favor. Architects thought that the new built-in cabinetry and the convenience of local supermarkets had made pantries unnecessary in the modern kitchen. According to a recent National Association of Home Builders survey, a kitchen pantry was the kitchen feature most wanted by buyers in the market for a new home. Whatever the size of your kitchen, it should include a convenient place to store groceries, and this critical storage requires careful thought and planning. If you own a home built before 1945, you are fortunate enough to have a pantry of some sort. Before the era of microwave meals and pre-processed cuisine, a well-stocked pantry was required for good domestic management. That so many pantries are being designed in period style is more than a nostalgic nod to the ever-practical pantries of by-gone years. A pantry should be large enough to hold at least a week's worth of groceries, and close enough to the food preparation area to be easily accessed. While size does matter, simplicity, organization and the right location are usually more important than size alone. A well-designed small pantry will usually provide better, more convenient and more functional storage than a poorly designed large pantry. Convenience, accessibility, and visibility are the key attributes of a great pantry. Accessible, if everything in the pantry can be easily reached and removed without moving anything else out of the way. Creating a great pantry requires closely adhering to the three Iron Rules of Storage. If the rules are followed, any storage is almost always convenient and easy to use. The rules apply to any storage, but particularly to kitchen storage, and even more particularly to pantry storage. A pantry should be located close to where the items in the pantry are first used. This is usually the food preparation area. If the kitchen has a baking area, then a separate baking pantry should be located near the baking center unless the main pantry can be placed between the two work centers, and do double duty. If storage is sized to the things being stored, it is easier to implement Rule 3, and little space is wasted. Shelves should be just deep enough to store one row of items, and high enough so that the items just fit. There should be no wasted space. Shelves should be adjustable so as storage requirements change the shelf heights can be changed. The goal to strive for in pantry design is at-a-glance visibility. Everything stored should be immediately visible. It should not be necessary to move something out of the way in order to see what's behind or beneath it. There should never be anything behind or underneath anything else. Obviously, this is an ideal that few pantries achieve completely, but the closer the pantry design is to this ideal, the more useful and convenient the pantry will be. Pantries come in three basic configurations: reach-in, pull-out (or swing-out), and walk-in. All have advantages and drawbacks. The reach-in pantry is the usually the most convenient, the pull-out pantry the least convenient, but a boon to small kit­chens with no wall space to spare. The walk-in pantry holds the most, but since it is often removed from centers of kitchen activity, it is best used as a remote, second pantry. A kitchen can have two, even three pan­tries. We commonly design kit­chens for large families or everything-from-scratch cooks to include a near pantry that holds small quantities of supplies most often used and one or more remote pantries that hold bulk supplies and large quantities. The near pantry is re-supplied from the remote pantry periodically as consumables are used up. This can be a multi-step process as the middle pantry is restocked every month or so from the cold room or very remote pantry in the basement, and the near pantry is restocked weekly from the middle pantry. The ideal reach-in pantry is shallow. Deep pantries hold more, but all the stuff in the back is not immediately visible and not easy to reach. As a practical maximum, the depth of a fixed pantry shelf should be no more than 16" (14" is better). If you happen to have more depth, the temptation is great to build deeper shelves on the theory that while you may not use the back few inches for primary storage, it does not hurt to have it for stuff you don't use as often. Right?. "3. Store items in a single layer with no item hidden behind or beneath another." Anything deeper than 16" requires a roll-out tray or a pull-out pantry. For cans and bottles, even 16" is too deep. Eight inches is the more useful maximum. The ideal overall depth of a reach-in pantry with shelves is between 22" and 24". This allows 14" to 16" storage shelves inside the pantry and 7" to 8" of can and bottle storage built into the door. All shelves should be adjustable. The best reach-in configuration we have found is the "batwing" pantry. Besides being the ultimate in storage convenience, it is relatively inexpensive to build. With the doors fully open everything in a batwing pantry is displayed in a panorama and easily reached. It does not require extensive pull-out hardware, which, because it must be able to hold a lot of weight, needs to be heavy-duty and can be costly. But, it does require extra hinges to hold the weight of the door without sagging. If the pantry shelves are more than 16" deep, then it is better to convert them to trays mounted on glides so they can be pulled out. Roll-out trays have the advantage of making everything in the pantry accessible, even the stuff at the very back of the tray. But, above eye-level, it is difficult to see what's on the tray. For this reason, roll-out trays are usually fitted with lazy susans above eye-level. A lazy susan turntable brings anything at the back of the pantry to the front where it can be seen at the flick of the wrist. The tradeoff is, however, that a round turntable stores only about 2/3rds the content of a rectangular shelf. Roll-out trays require full-extension, heavy-duty glides, and these are fairly expensive. And, typically the trays are not adjustable, although there is hardware available that provides limited height adjustment. The real disadvantage, however, is that you always have to open both pantry doors to get the clearance required to roll the trays out — a continuing nuisance. A pullout pantry is a reach-in pantry turned on end and inserted into a cabinet. A door panel is attached to the front. The pantry operates like a very large drawer. If it is accessible and viewable from both sides, it can be as much as 24" wide. If accessible from just one side, the 16" depth limit applies. A pull-out pantry is not as convenient to use as a bat-wing-style reach-in pantry. In order to get to the items stored, you must first extend the pantry, then push it back into place when you are done. It is generally more expensive to build per square foot of storage because it requires elaborate, heavy duty hardware. But in small kit­chens where space is at a premium, it may be the only pantry solution that provides anything like enough storage space. Like roll-out trays, a pull-out unit is not practical for anything above eye level. The individual shelves inside the pull-out can be made adjustable, which greatly increases the flexibility of the pantry. It is important to use gliding hardware that prevents the pantry from being slammed. This may dislodge items in the pantry which can jam the mechanism. A walk-in pantry is usually a small room, essentially a closet for storing food, separate from but adjacent to the kitchen, called a "larder" back in the day. 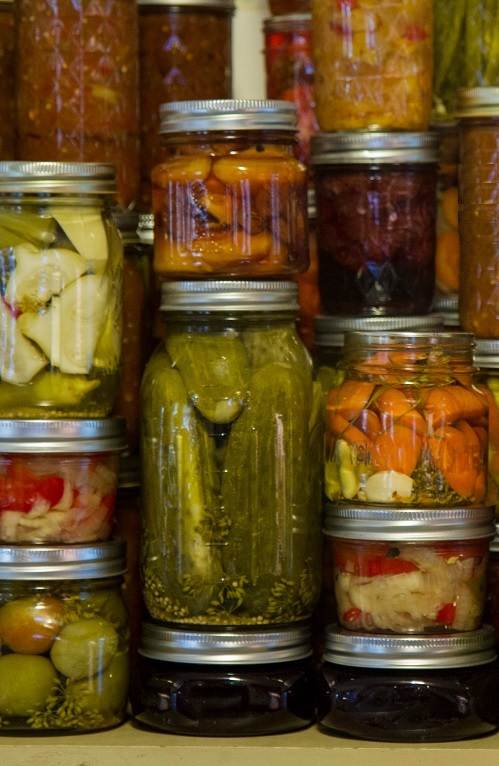 For many homeowners, a walk-in is the dream pantry that calls up visions of canning garden vegetables and making preserves. But, it is not as useful as you might think. A walk-in is great for storing large quantities of foodstuffs, particularly bulk items, but because it is usually remotely located, a walk-in can be inconvenient to use for storage of frequently-used items. For that reason, many kit­chens with walk-in pantries also include a smaller, more convenient pantry inside the kitchen that is restocked periodically from the larder. The walk-through pantry is a little different. Where the main purpose of a walk-in pantry is storage, the primary purpose of a walk-through pantry is getting from one place to another. It is first a hall-way or passage, and only secondarily a storage place. In designing a walk-through pantry, its primary purpose of providing a convenient and safe passage cannot be compromised. This usually means an extra-wide walk aisle. We usually recommend a minimum of 44". Wider is better, and 60" is the minimum for wheelchair access. Typical is a pantry/mudroom that you pass through on your way from the kitchen to the garage or back door. In old houses, it is often a converted porch. Groceries can be unloaded just as soon as you wipe your feet, which is very handy. But, it is important that the main function of a mudroom be preserved. It needs space for stowing coats, boots and other outerwear, including a bench for putting on and taking off shoes. This kitchen was once much larger, but a previous owner had taken some space to create a first-floor powder room under the stairs. To get enough pantry, a too-small breakfast nook was converted to pantry storage and coffee-bar. A second walk-past pantry was created by building-in a tall cabinet alongside the stairs leading to the basement. Space for this pantry was gotten by sealing 16" from the back of the powder room and relocating the toilet. This design violates one of the cardinal rules of pantry perfection: The pantry and refrigerator should be near each other. We wanted to put the refrigerator in the new pantry, but the owner preferred to keep the existing large windows. His instructions were gently but firmly put as something like: "Leave the damn windows alone!" So, that was that. But, the solution works; did not require major, and expensive, structural surgery; and gives the homeowners enough convenient food storage for two weeks. Not every pantry design solution can be absolutely perfect, but an imperfect solution can still be made to work well with a little creativity. A lot of valuable real estate in a walk-in or walk-through pantry is used for walking rather than storage. The temptation is great to minimize aisle space to maximize storage space. The minimum walkway or aisle width should be 36". You'll see why the first time you truck in a bunch of groceries to unload. Narrow aisles make it a knee and elbow knocking affair. Deep shelves in a walk-in or walk-through pantry are no more useful than deep shelves in a reach-in pantry. The maximum depth of stationary (non-pull-out) storage shelves is 16" no matter where they are located, and 14" is better. Depths as narrow as 10" will work for general storage and as little as 6" for cans and bottles. If one wall of a walk-in pantry could be used for deeper shelves, resist the temptation or install roll-out baskets or bins. Shelving above eye level should be stepped back. The shelf just above eye level should be no deeper than 14" and the one above that just 12". The one above that 10", and so on. This step back allows you to better see what's on these upper shelves. Shelving can be solid or an open wire grid. Solid shelving eliminates the risk of small items falling down between the grids but reduces visibility. It also tends to accumulate dust and debris and needs to be cleaned more often. Accordingly, the surface should be Melamine™ or some other very cleanable material. Coated or stainless wire shelving does not collect dust and debris, which simply falls through to the floor. It does not work, however, for small items, like spice containers, that can fall through the grid. It's easy to clean. A little Windex® and a paper towel are all it takes. The drawback, however, is that modern wire shelving often looks out of place in a period kitchen. To get the look we want in Craftsman and Victorian kit­chens, we often build our own shelves out of a wire that fits the period stretched on a wood frame. Woven wire cloth, for example, such as the venerable hardware cloth, has been around for over a century, and works for almost any historic period. We especially like open wire shelving for high shelves because you can see through the wire to get a better view of what's stored on the shelves. Careful design is important to convenience, functionality and efficiency of a pantry. But, its location in relation to the other elements in the kitchen is even more important. A well-designed pantry put in the wrong place is less useful than a poorly-designed pantry in the right place and impairs the efficiency of the cook. The very best designed and organized pantry is of only marginal use if it is not conveniently located. This means, according to Iron Rule 1, near where the stuff in the pantry is going to be used. This is usually the food preparation area of the kitchen. Ideally, a pantry should be placed within a few steps of the area where food is prepared. The general rule is not more than 48" (three steps), although this dimension is somewhat flexible. Many kitchen designs locate a tall pantry and refrigerator at opposite ends of the room. From a purely aesthetic point of view, this is good design because the height and bulk of these two large features balance each other. But, from a practical point of view, it is better to place cold storage (refrigerator) fairly close to dry storage (pantry) so that multiple trips are not required to gather the ingredients for a meal. This is a large, gourmet kitchen for an everything-from-scratch cook that we built in 2008. Food storage is located along one wall adjacent to the main walkway from the house to the family room, patio and pool. This location allows snack and beverage seekers to fetch items from the refrigerator or pantries without crossing the main part of the kitchen, which already has enough traffic. It is unavoidably in the pathway to the garage and basement. To allow easy passage through the kitchen without interfering with meal preparation, we enlarged the distance between facing cabinets to 62" to allow a clear walk path. Normally we recommend not more than 52". The refrigerator is flanked by two base cabinets that form the "landing zones" for both pantries and refrigerator. Landing zones provide a convenient place to set bags of groceries while they are unloaded. Each landing zone has its own light, and overhead recessed lighting illuminates the entire area. The cabinets in the rest of the kitchen are natural hickory. The cabinets in the pantry area were painted eggshell to make a visual distinction between the pantry area and the main kitchen. Pantries are floor to ceiling bat-wing style reach-in pantries with adjustable shelves that hold a two week's worth of provisions for this family of five. Locating it reasonably close to the prep area is usually enough, and being flexible about location also makes it easier to take into account some other important factors affecting the placement of other cabinets and appliances. From a purely aesthetic point of view locating a tall pantry and refrigerator at opposite ends of the room is good design because the height and bulk of these two large features balance each other. But, for ease of use, it is usually better to place cold storage (refrigerator) fairly close to dry storage (pantry) so that multiple trips are not required to gather the ingredients for a meal. In addition to being storage places, both the refrigerator and pantry are snack and beverage centers, especially in households with children. Access to between-meal snacks without entering the main part of the kitchen reduces kitchen traffic and possible interference with the meal preparation and clean-up processes. If at all possible, the pantry and refrigerator should be located on the perimeter of the kitchen in a spot that can be reached without traversing the kitchen proper. Every pantry should include or be adjacent to a countertop-height landing zone. The landing zone is a place to set bags of groceries while they are being loaded into the pantry or a place to temporarily stash ingredients while they are being unloaded. The National Kitchen and Bath Association, which has developed guidelines for just about everything in a kitchen, does not have a guideline for the size of a pantry landing zone. For refrigerators, it recommends a landing zone 15" wide on the handle side of the refrigerator or across from the refrigerator, but not more than 48" away. For more on the basic kitchen design guidelines, see The Thirty-One Kitchen Design Rules. These are also good rules for pantry landing zones. Very often overlooked, but extremely important, is pantry lighting. The ability to see what's in the pantry depends to a great extent on how well it is lit. This is especially true for reach-in pantries, which tend to be black holes without good lighting. Adequately lighting a pantry can be a problem. The usual solution is the install a recessed light in the ceiling in front of the pantry and call it good. The usual solution doesn't work. The top few shelves are well lit, but the illumination decreases toward the floor until the bottom shelves require a spelunker helmet (or flashlight) to find anything. The ideal lighting illuminates the contents of every shelf evenly. This is hard to do effectively. What we do, that works fairly well, is to install an LED light strip down the two front corners of the pantry cabinet. In this location they are out of sight, and, at 2.9 lumens per linear foot, the strips illuminate each shelf quite well. So the shelves don't pinch the lights, the front corners of the shelves are clipped. If more light is wanted, install the strips in the back corners as well — we have never found this to be necessary, however. So, after considerable discussion we arrive at some specific rules for pantry design to supplement the "Iron Rules of Storage", that, if followed, will almost certainly result in the perfect pantry. If it's unavoidable, any of these rules can be bent or broken, but the further you stray from the rules, the less serviceable your pantry is likely to be. 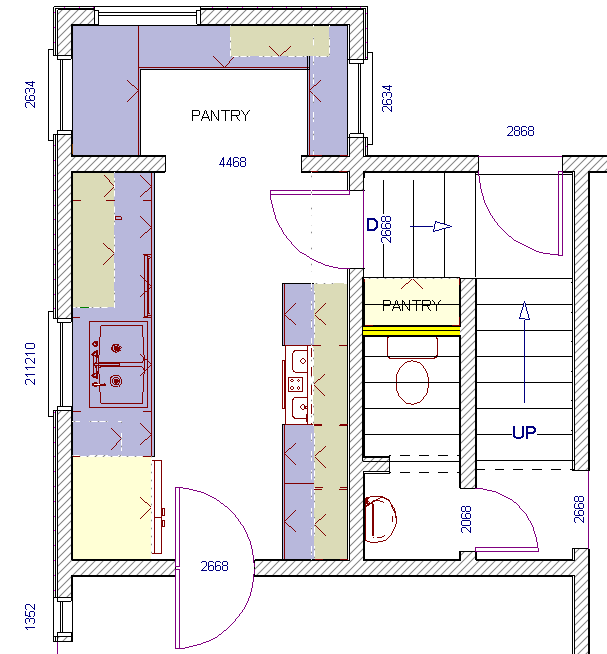 Locate the pantry within 48" of the food preparation area of the kitchen. Locate the refrigerator (cold storage) and pantries (dry storage) together. Locate the refrigerator and pantries at the edge of the kitchen so that snack and beverage seekers can get what they need without crossing into the working parts of the kitchen. If you have more than one pantry, locate at least one of them (the "near" pantry) within 48" of the food prep area. The 48" dimension is flexible. Locate the pantry as close as you can to the food preparation area, but if you need to go over the 48" rule so the rest of the kitchen works better, go ahead. Designers are tempted to place large pantries and refrigerators at opposite ends of a kitchen for aesthetic balance. This sort of placement requires the cook to walk to opposite ends of the kitchen to gather supplies for a meal and should be avoided. The refrigerator and pantries cannot be placed at the periphery of the kitchen, a separate snack and beverage center should be considered. The maximum depth of a stationary storage shelf is 16" (14" is better). 6"-8" for bottles and cans. Shelving should be adjustable in a minimum of 2" increments. Shelves higher than eye level should be stepped back in increments of 2-3" so contents can be viewed easily without a step stool or ladder. Any pantry more than 16" deep needs pullout trays. drawers or turntables so the items stored at the back can be seen and reached. Where storing some items behind others is unavoidable, use lazy susans where possible to bring items in back to the front where they can be seen. If possible, shelves above eye level should be coated wire or open grid wood to make it possible to view items on the shelf from below. Walk-In Pantry: The minimum walk aisle width in a walk-in pantry is 36", 42" is better. Walk-Through Pantry: The minimum walk aisle width in a walk-through pantry is 42", 48" is better. A 42" walk aisle allows two people to slide past each other. A walk aisle 48" wide is recommended for two people to pass each other without turning sideways, and is highly recommended for walk-through pantries. A walk aisle 60" wide is the minimum recommended for wheelchair access. Avoid the temptation to store large, bulky items in the walkway space. Items placed on shelves should not project into the minimum walkway space. For more in-depth information on Walk-ways and work-aisles, please see The Thirty-One Kitchen Design Rules. A pantry should be adjacent to a countertop-height landing area at least 15" wide to facilitate unloading groceries. A countertop across a work aisle, but not more than 48" from the pantry, can serve as a convenient landing area. If the pantry is a "batwing" style cabinet, landing areas to the side of the cabinet can be blocked by the open doors. In this case, a landing area across the aisle from the pantry is preferred. If there is no room for exterior landing zones, a pull-out shelf built into the pantry can serve as a less convenient landing zone. Install adequate lighting so every shelf of a pantry is clearly illuminated with glare-free shadowless light. A pullout pantry unit can be illuminated by general room lighting and usually does not need additional lighting. Any sort of recessed pantry needs its own lighting. Overhead room lighting will not sufficiently illuminate a recessed pantry. The best solution we have found is to install an LED light strip down the two front corners of the pantry cabinet. In this location they are out of sight, and, at 2.9 lumens per linear foot, the strips illuminate each shelf quite well. So the shelves don't pinch the lights, the front corners of the shelves need to be clipped. Adequate lighting is facilitated if open grid shelving rather than solid shelving is used. And, that should about do it. If you design your pantry according to these guidelines, it will work well for you. The next step is integrating your pantry into the rest of your new kitchen, and that's a whole other issue. But, if we can help, contact us to see what can be done. Marks, Katie. Cold Pantries for Green kit­chens. Homeworx. 23 Dec 2013. Networx Systems, LLC. Matt, Renee. The Complete Kitchen Pantry Guide. e-Book.